We have been talking a lot about planet earth and music at our house. I decided to mix the two together to celebrate the earth with some home spun music. I used ribbon to secure the two plates together but if I could have found my stapler, I would have used it. Stapling is by far the best way in my opinion to keep the plates together. Gather your materials. 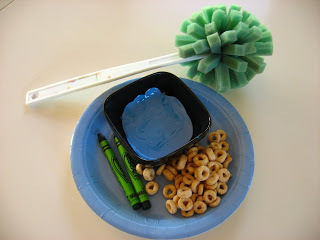 You will need 2 paper plates,something to make some sound ( bigger is better- pasta, O cereal) some green crayons, blue paint, a large brush or sponge( we used this sponge because my son saw it and he insisted, a regular sponge would work great), a stapler or a hole punch and ribbon. 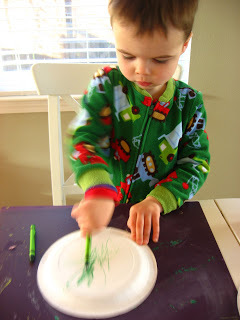 Give your child the plates and have them draw the land of the earth with green crayons. They need to press hard for the wax to be think enough for the paint to be repelled. After I showed my son how to press hard and make the green dark he was good to go. Do both plates. 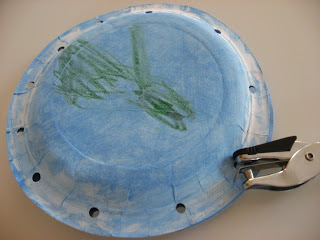 Cover the plates with the blue paint. 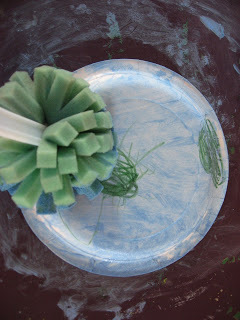 The paint should be repelled from the wax, if the paint is covering it, just blot it with a paper towel. Do the 2nd plate, let dry. 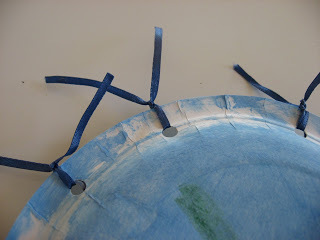 If you are doing the ribbons for securing the plates, punch the holes in both plates at the same time, make sure the holes are close enough together that the stuff inside doesn’t fly out. Put the pasta or cereal Os inside ( I’m using cereal Os because they were left out after an unfinished snack yesterday and I thought that is a perfect example of not wasting! ). Tie the plates together with the ribbons. Or if you are stapling, now is the time! Make some music and celebrate our wonderful world! 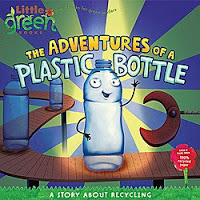 ” The Adventures Of A Plastic Bottle “ by Alison Inches is awesome! I only wish that my son was old enough to enjoy it as much as I did. It’s not aimed at 2 year olds at all, but he did like to open it to the page with the recycling truck and point out all the parts to me. The book itself takes the reader through the complete process from crude oil, to bottle and then to synthetic fleece. I am not too proud to admit I learned s a few new things and had a few good laughs along the way with the books little bits of humor too. I think most 5 year olds would enjoy this book, and it’s easy to break it down for those unable to sit for this much text. Also the book was printed on 100% post consumer waste paper. 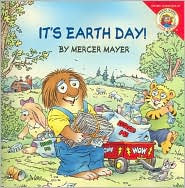 “It’s Earth Day” by Mercer Mayer . In this book in the Little Critter series, we follow along as Little Critter tries to make a climate change machine to reverse the effects of global warming. Along the way other green choices are explained like taking the school bus instead of each child being driven in their own cars, not letter water run, and the three Rs. 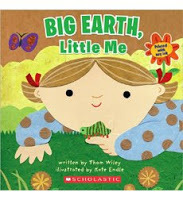 “BIG EARTH, Little Me “ by Thom Wiley is a cute introduction into an environmental theme for toddlers. 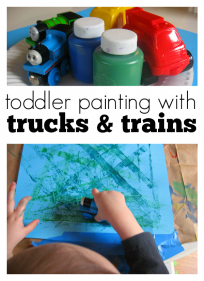 The book is a lift the flap format and the pages are extra sturdy for fumbly toddler fingers. I love the illustrations by Kate Endle they bring the super simple text to life, and get across the point that even little kids can help the earth. 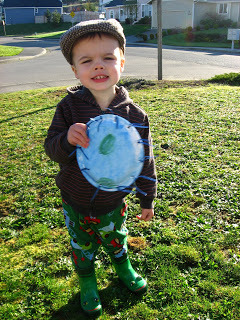 Previous Post: Earth Day Inspired – Letter Of The Week ! This is one of my fave projects yet! Cannot wait to try it – because you know, my little Beast really needs a way to make MORE noise, LOL! Ooohh, perfect, was looking for an easy craft! 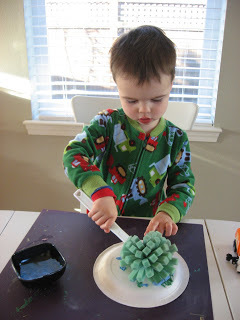 Oh I remember doing one of these with my kiddo, then it was making a rain stick. Thanks so much for featuring the book I illustrated. Recycling is one of my topics! 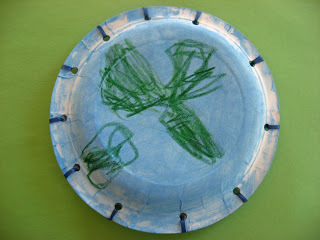 I just wanted to tell you that I finally got around to doing your peacock craft with my son and he LOVED it!!! Thank you!! I am so glad you guys like it, we’ve been playing with it more today . Kate- thank you so much for such a beautiful book! I had the kids make them in my Sunday school class today, and we had so much fun both making them and playing with them! So, excited to try more of your projects!